, the most illustrious of English poets, was by birth a gentleman, descended from the proprietors of Milton, near Thame in Oxfordshire, one of whom forfeited his estate in the contests between the houses of York and Lancaster. His grand-father was under-ranger of the forest of Shotover in Oxfordshire, and being a zealous Roman catholic, disinherited his son, of the same name, for becoming a protestant. This son, when thus deprived of the family property, was a student at Christchurch, Oxford, but was now obliged to quit his studies, and going to London became a scrivener. That he retained his classical knowledge appears from his son addressing him in one of his most elaborate Latin poems; he was also a great proficient in music, a voluminous composer, and, in the opinion of Dr. Burney, “equal in science, if not genius, to the best musicians of his age.” He married a lady of the name of Custon, of a Welsh family. By her he had two sons, John the poet, Christopher, and Anne. Anne became the wife of Mr. Edward Phillips, a native of Shrewsbury, who was secondary to the crown office in | chancery. Christopher, applying himself to the study of the law, became a bencher of the Inner Temple, was knighted at a very advanced period of life, and raised by James II. first to be a baron of the Exchequer, and afterwards one of the judges of the Common-pleas. During the rebellion he adhered to the royal cause, and effected his composition with the republicans by the interest of his brother. In his old age he retired from the fatigues of business, and closed, in the country, a life of study and devotion. John Miltcrti was born at his father’s house in Breadstreet, Cheapside, Dec. 9, 1608. From his earliest years his father appears to have discerned and with great anxiety cultivated his talents. He tells us himself that his father destined him when he was yet a child to the study of polite literature, and so eagerly did he apply, that from his twelfth year, he seldom quitted his studies till the middle of the night; this, however, he adds, proved the first cause of the ruin of his eyes, in addition to the natural weakness of which, he was afflicted with frequent headachs. Some part of his early education was committed to the care of Mr. Thomas Young, a puritan minister; and he was also placed for some time at St. Paul’s school, thea under the direction of Mr. Alexander Gill, with whose son, Alexander, Milton seems to have contracted a warm and lasting friendship. In February 1625, when in his seventeenth year, he was entered a pensioner at Christ’s-college, Cambridge, where he had for his tutor Mr. William Chappel, afterwards bishop of Cork and Ross. 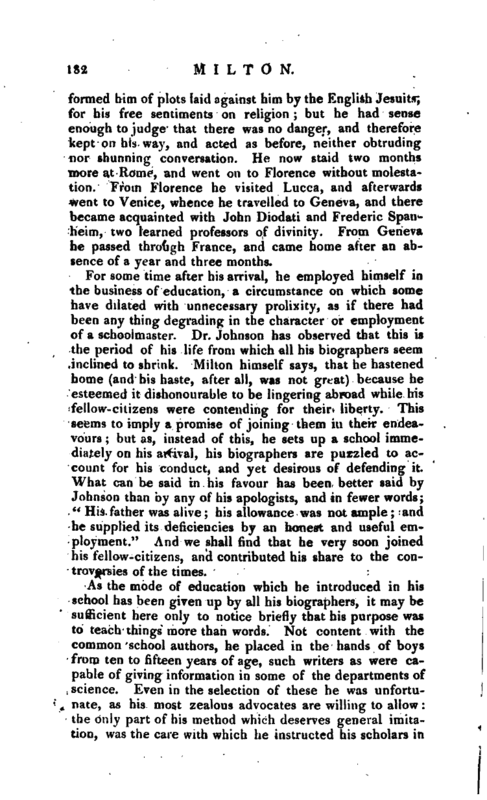 Of his conduct and the treatment which he experienced in his college, much has been made the subject of dispute. The most serious charge brought against him is, that he wasexpelledy for which there seems no reasonable foundation whatever. The register of the college proves that he regularly kept his terms, and as regularly took both his degrees. A charge of less consequence, that he had once received corporal punishment, seems scarcely worth the pains that have been bestowed in refuting it, if, according to the latest of his zealous apologists, no injury to his reputation would be the necessary result of its admission. It is allowed, however, to be probable that he might offend the governors of his college by the dislike, early instilled into his mind by his tutor Young, of the discipline of the church, or the plan of education then observed. Whateyer may be in | this, he passed -seven years at the university, and after taking his master’s degree, retired to his father’s house, at Horton in Buckinghamshire. 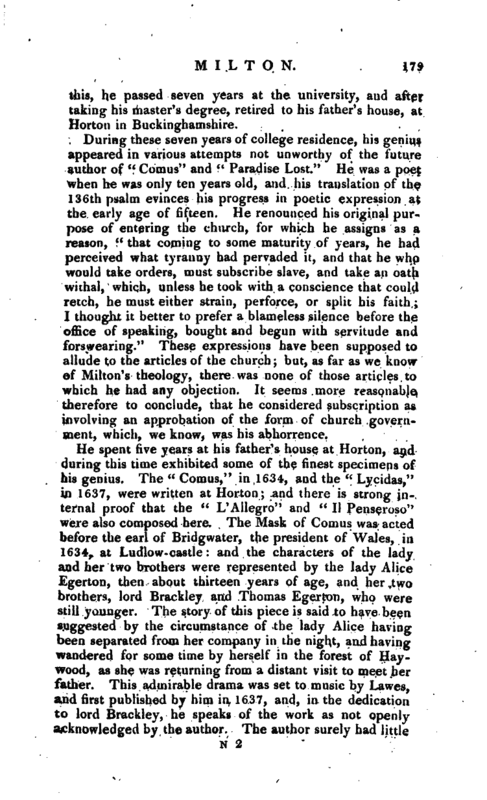 During these seven years of college residence, his genius appeared in various attempts not unworthy of the future author of “Comus” and “Paradise Lost.” He was a poet when he was only ten years old, and his translation of the 136th psalm evinces his progress in poetic expression at the early age of fifteen. He renounced his original purpose of entering the church, for which he assigns as a reason, “that coming to some maturity of years, he had perceived what tyranny had pervaded it, and that he who would take orders, must subscribe slave, and take an oath withal, which, unless h^ took with a conscience that could retch, he must either strain, perforce, or split his faith; I thought it better to prefer a blameless silence before the office of speaking, bought and begun with servitude and forswearing.” These expressions have been supposed to allude to the articles of the church; but, as far as we know of Milton’s theology, there was none of those articles to which he had any objection. It seems more reasonable therefore to conclude, that he considered subscription as involving an approbation of the form of church government, which, we know, was his abhorrence. He spent five years at his father’s house at Horton, and during this time exhibited some of the finest specimens of his genius. The “Comus,” in 1634, and the “Lycidas,” in 1637, were written at Horton; and there is strong internal proof that the “L’AIlegro” and “II Penseroso” were also composed here. The Mask of Comus was acted before the earl of Bridgwater, the president of Wales, in 1634, at Ludlow-castle: and the characters of the lady and her two brothers were represented by the lady Alice Egerton, then about thirteen years of age, and her two brothers, lord Brackley and Thomas Egerton, who were still younger. The story of this piece is said to have been suggested by the circumstance of the lady Alice having been separated from her company in the night, and havincr wandered for some time by herself in the forest of Haywood, as she was returning from a distant visit to meet her father. This admirable drama was set to music by Lawes, and first published by him in 1637, and, in the dedication to lord Brackley, he speaks of the work as not openly acknowledged by the author. The author surely had little | to fear; it would be difficult to discover an age barbarous enough to refuse the highest honours to the author of a work so truly poetical. The “Lycidas” was written, as there is reason to believe, at the solicitation of the author’s old college, to commemorate the death of Mr. Edward King, one of its fellows, a man of great learning, piety, and talents, who was shipwrecked in his passage from Chester to Ireland. It formed part of a collection of poems, published on this melancholy occasion, in 1638, at the university press; and its being thus printed in a collection, may perhaps diminish the wonder expressed by one of Milton’s biographers, that a poem, breathing such hostility to the clergy of the Church of England, and menacing their leader with the axe, should be permitted to issue from the university press. There is no other way of accounting for this than by supposing that it had not been read before it went to press. 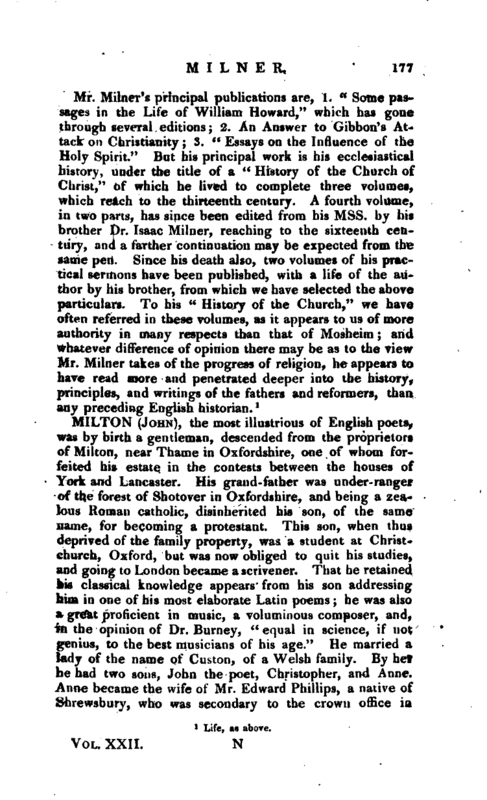 “Lycidas” has been severely criticised by Dr. Johnson, and but feebly supported by Milton’s other biographers. Of the “L‘ Allegro,” and “II Penseroso,” the precise time of writing cannot be positively ascertained. They made their first appearance in a collection of our author’s poems, published by himself in 1645; but there is reason from internal evidence to infer, that they were written in the interval between the composition of “Comus” and that of “Lycidas,” consequently while he lived at Horton. Of these two noble efforts of the imagination, the opinion of the public is uniform; eVery man that reads them, reads them with pleasure. In 1638, on the death of his mother, he obtained his father’s leave to travel, and about the same time a letter of instructions from sir Henry Wotton, then provost of Eton, but who had resided at Venice as ambassador from James I. He went first tp Paris, where, by the favour of lord Scudainore, he had an opportunity of visiting Grotius, at that time residing at the French court as ambassador from Christina of Sweden. From Paris he passed into Italy, of which he had with particular diligence studied the language and literature; and, though he seems to have intended a very quick perambulation of the country, he staid two months at Florence, where he was introduced to the academies, and received with every mark of esteem. Among other testimonies may be mentioned the verses addressed to him by Carlo Dati> Erancini, and others, whicfe, | prove that they considered a visit from Milton as no common honour. From Florence he went to Sienna, and from Sienna to Rome, where he was again received with kindness by the learned and the great. Holstenius, the keeper of the Vatican library, who had resided three years at Oxford, introduced him to cardinal Barberini; and he, on one occasion, at a musical entertainment, waited for him at the door, and led him by the hand into the assembly. Here it is conjectured that Milton heard the accomplished and enchanting Leonora Baroni sing, a lady whom he has honoured with three excellent Latin epigrams. She is also supposed to have been celebrated by Milton in her own language, and to have been the object of his love in his Italian sonnets. While at Rome, Selvaggi praised Milton in a distich, and Salsilfl in a tetrastic, on which he put some value by printing them before his poems. The Italians, says Dr. Johnson, were gainers by this literary commerce; for the encomiums with which Milton repaid Salsilli, though not secure against a stern grammarian, turn the balance indisputably in Milton’s favour. 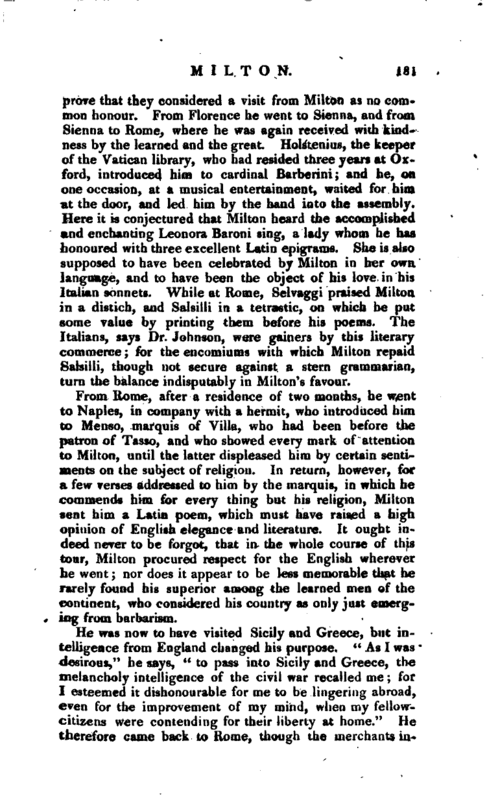 From Rome, after a residence of two months, he went to Naples, in company with a hermit, who introduced him to Menso, marquis of Villa, who had been before the patron of Tasso, and who showed every mack of attention to Milton, until the latter displeased him by certain sentiments on the subject of religion. In return, however, for a few verses addressed to him by the marquis, in which he commends him for every thing but his religion, Milton sent him a Latin poem, which must have raised a high opinion of English elegance and literature. It ought indeed never to be forgot, that in the whole course of this tour, Milton procured respect for the English wherever he went; nor does it appear to be less memorable that he rarely found his superior among the learned men of the continent, who considered his country as only just emerging from barbarism. He was now to have visited Sicily and Greece, but intelligence from England changed his purpose. “As I was desirous/’ he says,” to pass into Sicily and Greece, the melancholy intelligence of the civil war recalled me; for I esteemed it dishonourable for me to be lingering abroad, even for the improvement of my mind, when my fellowcitizens were contending for their liberty at home." He therefore came back to Rome, though the merchants | informed him of plots laid against him by the English Jesuits, for his free sentiments on religion; but he had sense enough to judge that there was no danger, and therefore kept on his way, and acted as before, neither obtruding nor shunning conversation. He now staid two months more at Rome, and went on to Florence without molestation. From Florence he visited Lucca, and afterwards went to Venice, whence he travelled to Geneva, and there became acquainted with John Diodati and Frederic Spanheim, two learned professors of divinity. From Geneva he passed through France, and came home after an absence of a year and three months. For some time after his arrival, he employed himself in the business of education, a circumstance on which some have dilated with unnecessary prolixity, as if there had been any thing degrading in the character or employment of a schoolmaster. Dr. Johnson has observed that this is the period of his life from which all his biographers seem inclined to shrink. Milton himself says, that he hastened home (and his haste, after all, was not great) because he esteemed it dishonourable to be lingering abroad while his fellow-citizens were contending for their liberty. This seems to imply a promise of joining them in their endeavours; but as, instead of this, he sets up a school immediately on his arrival, his biographers are puzzled to account for his conduct, and yet desirous of defending it. What can be said in his favour has been better said by Johnson than by any of his apologists, and in fewer words; “His father was alive; his allowance was not ample; and he supplied its deficiencies by an honest and useful employment.” And we shall find that he very soon joined his fellow-citizens, and contributed his share to the controversies of the times. As the mode of education which he introduced in his school has been given up by all his biographers, it may be sufficient here only to notice briefly that his purpose was to teach things more than words. Not content with the common school authors, he placed in the hands of boys from ten to fifteen years of age, such writers as were capable of giving information in some of the departments of science. Even in the selection of these he was unfortunate, as his most zealous advocates are willing to allow: the only part of his method which deserves general imitation, was the care with which he instructed his scholars in | religion. Every Sunday was spent upon theology, of which he dictated a system to them founded on the principles of the Genevan divines. He also read and probably commented on a chapter in the Greek Testament. His first school was at his lodgings in St. Bride’s church-yard, but as the number of his scholars increased, he removed to a house in Alcjersgate-street. The time, however, was now come when, as Johnson says, he was to lend “his breath to blow the flames of contention.” In 1641 he published a treatise of “Reformation,” in two books, against the established church; and soon after one, “Of Prelatical Episcopacy,” Against the learned Usher, who had written a confutation of “Smectymnuus,” which was intended as an answer to bishop Hall’s “Humble Remonstrance,” in defence of Episcopacy. His next work was “The Reason of Church Government urged against Prelacy,” 1642. In this book, says Johnson, he discovers, not with ostentatious exultation, but with calm confidence, his high opinion of his own powers; and promises to undertake something, he yet knows not what, that may be of use and honour to his country. “This,” says Milton, “is not to be obtained but by devout prayer to the eternal Spirit that can enrich with all utterance and knowledge, and sends out his Seraphim with the hallowed fire of his altar, to touch and purify the lips of whom he pleases. 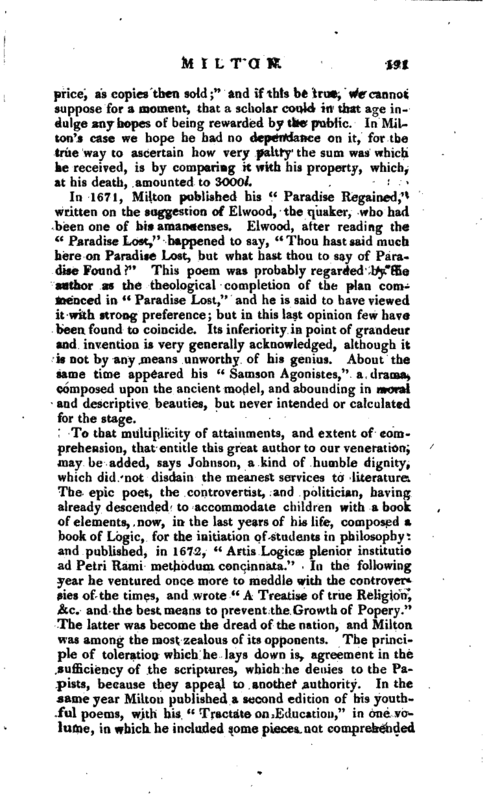 To this must be added, industrious and select reading, steady observation, and insight into all seemly and generous arts and affairs; till which in some measure be compast, I refuse not to sustain this expectation.” From a promise like this, adds John* son, at once fervid, pious, and rational, might be expected the “Paradise Lost.” He published the same year two more pamphlets on the same question, with which the controversy appears to have ended, and episcopacy was ‘soon afterwards overwhelmed by the violent meanj for which the press had long prepared. About the time that the town of Reading was taken by the earl of Essex, Milton’s father came to reside in his house, and his school increased. In 1643, his domestic comfort was disturbed by an incident which he had hoped would have rather promoted it. This was his marriage to Mary, the daughter of Richard Powell, esq. a magistrate in Oxfordshire, and a loyalist. The lady was brought to London, but did not remain above a month with her | husband, when under pretence of a visit to her relations, she wholly absented herself, and resisted his utmost and repeated importunities to return. His biographers inform us that the lady had been accustomed to the jovial hospitality of the loyalists at her father’s house, and that after a month’s experience of her new life, she began to sigh for the gaieties she had left, &c. Whether this will sufficiently account for her conduct, our readers may consider. 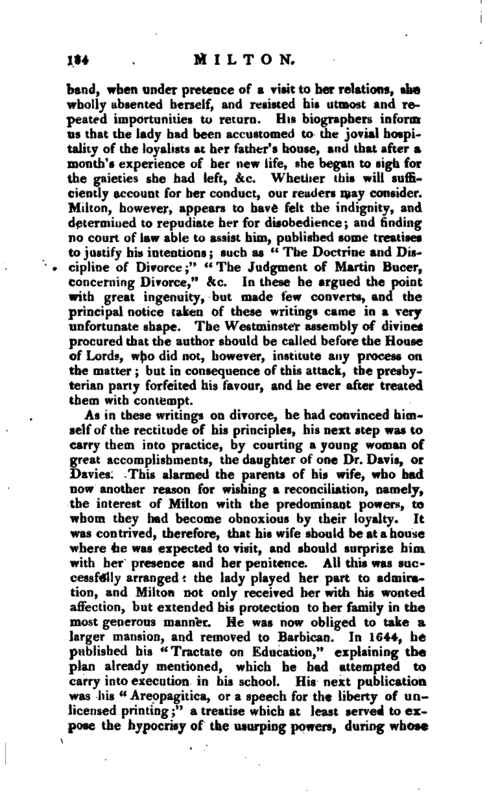 Milton, however, appears to have felt the indignity, and determined to repudiate her for disobedience; and finding no court of law able to assist him, published some treatises to justify his intentions; such as “The Doctrine and Discipline of Divorce;” “The Judgment of Martin Bucer, concerning Divorce,” &c. In these he argued the point with great ingenuity, but made few converts, and the principal notice taken of these writings came in a very unfortunate shape. The Westminster assembly of divines procured that the author should be called before the House of Lords, who did not, however, institute any process on the matter; but in consequence of this attack, the presbyterian party forfeited his favour, and he ever after treated them with contempt. As in these writings on divorce, he had convinced himself of the rectitude of his principles, his next step was to carry them into practice, by courting a young woman of great accomplishments, the daughter of one Dr. Davis, or Davies. This alarmed the parents of his wife, who had now another reason for wishing a reconciliation, namely, the interest of Milton with the predominant powers, to whom they had become obnoxious by their loyalty. It was contrived, therefore, that his wife should be at a house where he was expected to visit, and should surprize him with her presence and her penitence. All this was successfully arranged: the lady played her part to admiration, 1 and Milton not only received her with his wonted affection, but extended his protection to her family in the most generous manner. He was now obliged to take a larger mansion, and removed to Barbican. In 1644, he published his ^ Tractate on Education,“explaining the plan already mentioned, which he had attempted to carry into execution in his school. 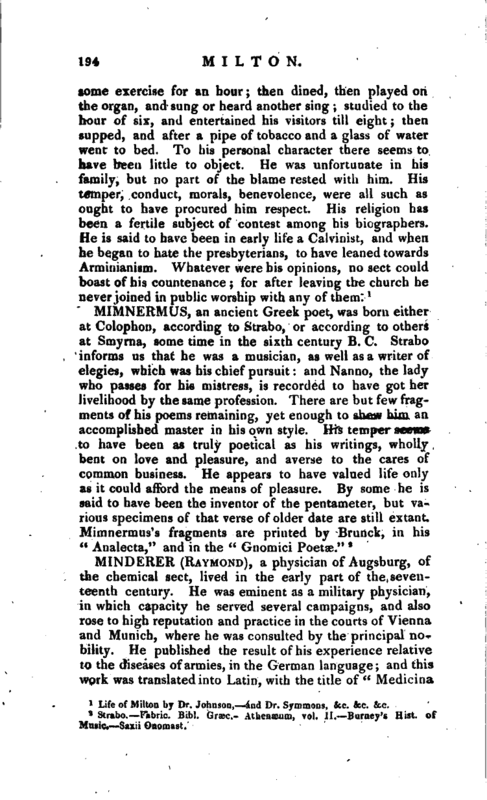 His next publication was his” Areopagitica, or a speech for the liberty of unlicensed printing;" a treatise which at least served to expose the hypocrisy of the usurping powers, during whose | reign the liberty of the press was as much restrained as in any period of the monarchy, nor perhaps at any time was Milton’s unbounded liberty less relished. Though his controversial, and other engagements, had for some time suspended the exertion of his poetical talents, yet he did not suffer his character as a poet to sink into oblivion, and in 1645, he published his juvenile poems in Latin and English, including, for the first time, the “Allegro” and “Penseroso.” in 1646, Milton’s wife produced her first child, and in the following year, in which his father died, the family of the Powells returned to their own mansion, and his house was resigned once more to literature. In this house, in which his second daughter Mary was born, he did not continue long, but exchanged it for one of smaller cKmensions in High Holborn. He is not known to have published any thing afterwards till the king’s death, when finding that measure condemned by the Presbyterians, he wrote a treatise to justify it. Of all Milton’s political works this reflects least credit on his talents, or his principles. Even those who have been most disposed to vindicate him against all censure, and to represent him invulnerable both as a politician and a poet, seem to shrink from the task of defending him in this instance, and candidly tell us, that they meet with an insuperable difficulty in the very title of the book “TheTenure of Kings and Magistrates proving, that it is lawful, and hath been held so through all ages, for any who have the power, to call to account a tyrant or wicked king: and after due conviction, to depose and put him to death, if the ordinary magistrate have neglected or denied to do it.” Here, therefore, the right to punish kings belongs to any who have the power, and their having the power makes it lawful, a doctrine so monstrous as to be given up by his most zealous advocates, as “a fearful opening for mischief:” but it was, in truth, at that time, what Milton intended it to be, a justification, not of the people of England, for they had no hand in the king’s murder, but of the army under Ireton and Cromwell. That Milton was also at this time under the strong influence of party-spirit, appears from his attack on the Presbyterians in this work, the avowed ground of which is their inconsistency. When, however, we examine their inconsistency, as he has been pleased to state it, it amounts to only this, that they contributed in common with the Independents and | other sectaries and parties, to dethrone the king; but r wished to stop short of his murder. Every species of opposition to what they considered as tyranny in the king, they could exert, but they thought it sufficient to deprive him of power, without depriving him of life. His next publication was, “Observations upon the articles of Peace, which the earl of Ormond had concluded at Kilkenny, on Jan. 17, 1643-9, in the king’s name, and by his authority, with the popish Irish rebels,” &c. The purport of this also was to render the royal cause more odious by connecting it with the Irish massacre; and that the sentiments of the nation might become yet more completely republican, he now employed himself in composing “A History of England.” Of this, however, he wrote only six books, which bring it no lower down than to the battle of Hastings. It presents a perspicuous arrangement of the fabulous, and less interesting part of our history; but, as he never resumed the task, it is impossible to say in what way he could have rendered the events of more recent times subservient to his purpose. 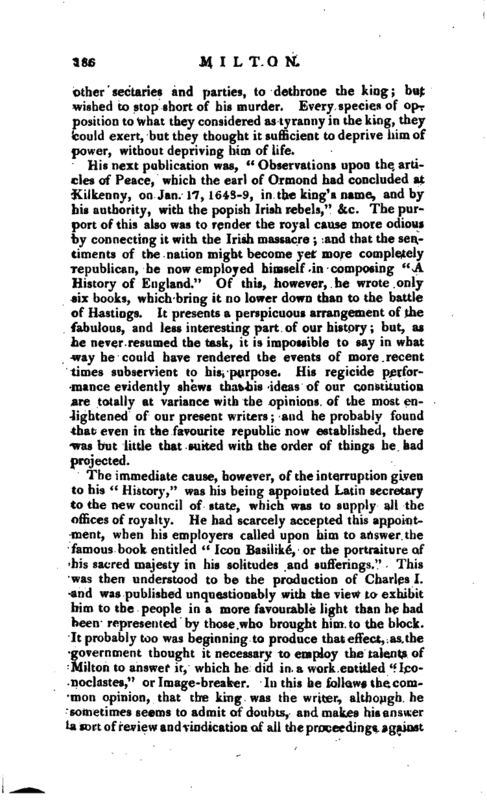 His regicide performance evidently shews that his ideas of our constitution are totally at variance with the opinions of the most enlightened of our present writers; and he probably found that even in the favourite republic now established, there was but little that suited with the order of things he had projected. The immediate cause, however, of the interruption given to his “History,” was his being appointed Latin secretary to the new council of state, which was to supply all the offices of royalty. He had scarcely accepted this appointment, when his employers called upon him to answer the famous book entitled “Icon Basihk^, or the portraiture of his cacred majesty in his solitudes and sufferings.” This was then understood to be the production of Charles I. and was published unquestionably with the view to exhibit him to the people in a more favourable light than he had been represented by those who brought him to the block. 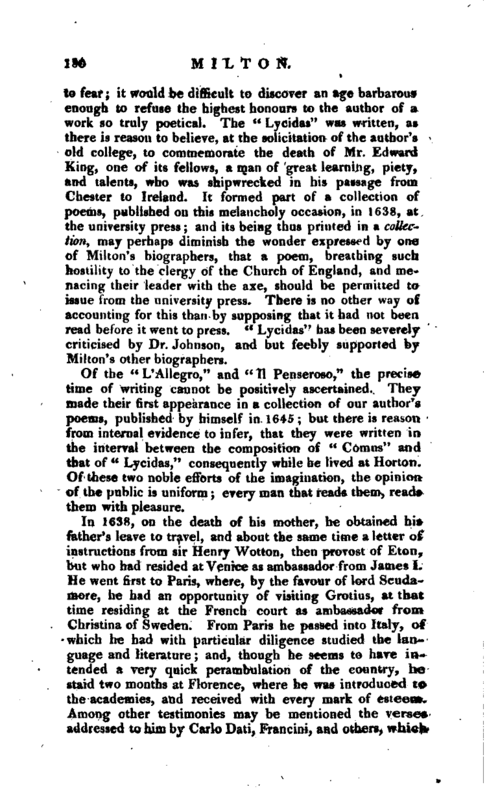 It probably too was -beginning to produce that effect, as the government thought it necessary to employ the talents of Milton to answer it, which he did in a work entitled “Iconoclastes,” or Image-breaker, In this he follows the common opinion, that the king was the writer, although he sometimes seems to admit of doubts, and makes his answer a. sort of review and vindication of all the proceedings against | the court. This has been praised as one of the ablest of all Milton’s political tracts, while it is at the same time confessed that it did not in the least diminish the popularity of the “Icon,” of which 48,500 are said to have been sold, and whether it was the production of the king or of bishop Gauden, it must have harmonized with the feelings and sentiments of a great proportion of the public. 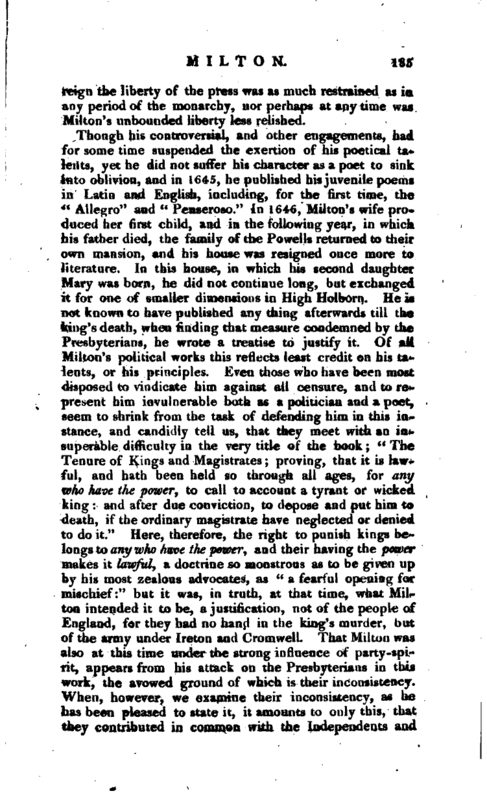 The story of Milton’s inserting a prayer taken from Sidney’s “Arcadia,” and imputing the use of it to the king as a crime, appears to have no foundation; but we know not how to vindicate this and other petty objections to the king’s character, from the charge of personal animosity. 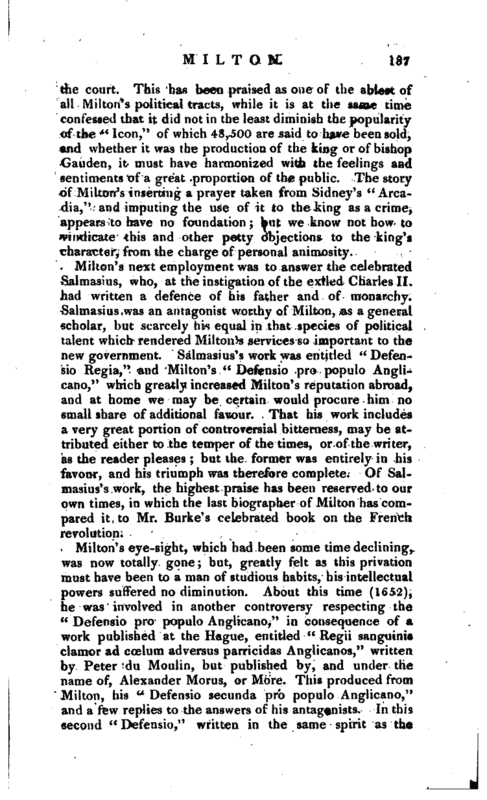 Milton’s next employment was to answer the celebrated Salmasius, who, at the instigation of the exiled Charles II. had written a defence* of his father and of monarchy. Salmasius was an antagonist worthy of Milton, as a general scholar, but scarcely his equal in that species of political talent which rendered Milton’s services so important to the new government. Salmasius’s work was entitled “Defensio Kegia,” and Milton’s “Defensio pro populo Anglicano,” which greatly increased Milton’s reputation abroad, and at home we may be certain would procure him no small share of additional favour. That his work includes a very great portion of controversial bitterness, may be attributed either to the temper of the times, or of the writer, as the reader pleases; but the former was entirely in his favour, and his triumph was therefore complete. 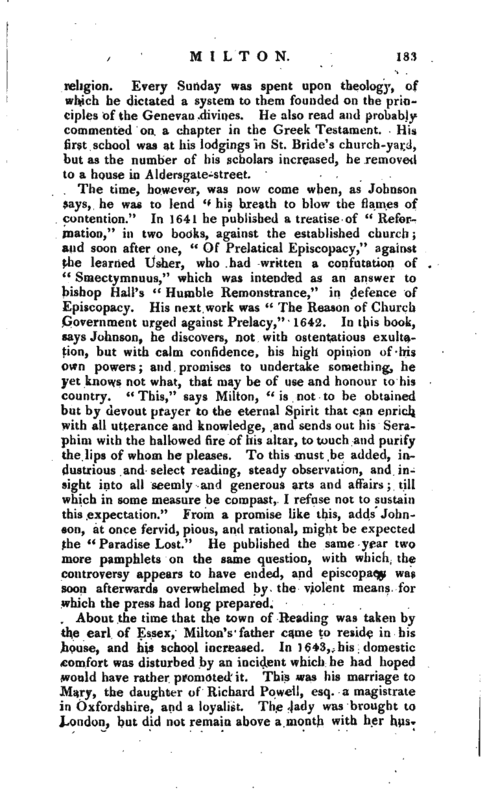 Of Salmasius’s work, the highest praise has been reserved to our own times, in which the last biographer of Milton has com* pared it to Mr. Burke’s celebrated book on the French revolution. Milton’s eye-sight, which had been some time declining, was now totally gone; but, greatly felt as this privation must have been to a man of studious habits, his intellectual powers suffered no diminution. About this time (1652), he was involved in another controversy respecting the “Defensio pro populo Anglicano,” in consequence of a work published at the Hague, entitled “Regii sanguinis. clamor ad coelum adversus parricidas Anglicanos,” written by Peter du Moulin, but published by, and under the name of, Alexander Morus, or More. This produced from Milton, his “Defensio secunda pro populo Anglicano,” and a few replies to the answers of his antagonists. 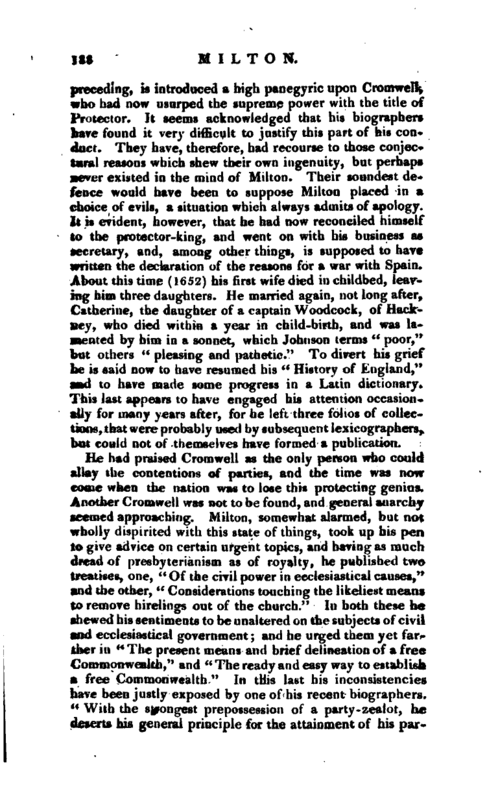 In this second “Defensio,” written in the same spirit as thq | preceding, is introduced a high panegyric upon Cromwell, who had now usurped the supreme power with the title of Protector. It seems acknowledged that his biographers have found it very difficult to justify this part of his conduct. They have, therefore, had recourse to those conjectural reasons which shew their own ingenuity, but perhaps never existed in the mind of Milton, Their soundest defence would have been to suppose Milton placed in a choice of evils, a situation which always admits of apology. It is evident, however, that he had now reconciled himself to the protector-king, and went on with his business as secretary, and, among other things, is supposed to have written the declaration of the reasons for a war with Spain. About this time (1652) his first wife died in childbed, leaving him three daughters. He married again, not long after, Catherine, the daughter of a captain Woodcock, of Hacktiey, who died within a year in child-birth, and was lamented by him in a sonnet, which Johnson terms “poor,” but others “pleasing and pathetic.” To divert his grief he is said now to have resumed his “History of England,” and to have made some progress in a Latin dictionary. This last appears to have engaged his attention occasionally for many years after, for he left three folios of collections, that were probably used by subsequent lexicographers, but could not of themselves have formed a publication. He had praised Cromwell as the only person who could allay the contentions of parties, and the time was now come when the nation was to lose this protecting genius. Another Cromwell was not to be found, and general anarchy seemed approaching. 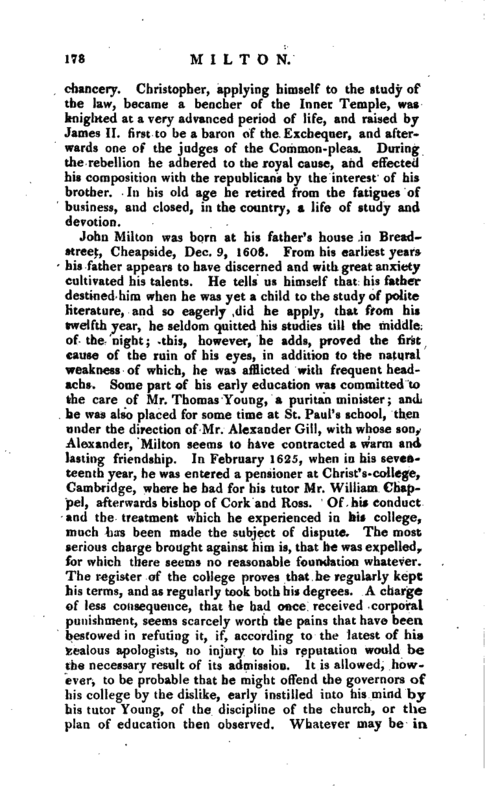 Milton, somewhat alarmed, but not wholly dispirited with this state of things, took up his pen to give advice on certain urgent topics, and having as much dread of presbyterianism as of royalty, he published two treatises, one, “Of the civil power in ecclesiastical causes,” and the other, “Considerations touching the likeliest means to remove hirelings out of the church.” In both these he shewed his sentiments to be unaltered on the subjects of civil and ecclesiastical government; and he urged them yet farther in “The present means and brief delineation of a free Commonwealth,” and “The ready and easy way to establish a free Commonwealth.” In this last his inconsistencies have been justly exposed by one of his recent biographers. “With the strongest prepossession of a party-zealot, he deserts his general principle for the attainment of his | particular object: and thinks that his own opinions ought to be enforced in opposition to those of the majority of the nation. Aware also that a frequent change of the governing body might be attended with inconvenience and possible danger, he decides against frequent parliaments, and in favour of a permanent council. Into such inconsistencies was he betrayed by his animosity to monarchy, and his bigoted attachment to whatever carried the name of a republic.” These pamphlets were answered both in a sportive and serious way, but neither probably gave him much uneasiness. His last effort in the cause of republicanism was entitled “Brief notes” on a loyal sermon preached by Dr. Matthew Griffith, one of the late king’s chaplains: and with this terminated his political controversies. Charles II. 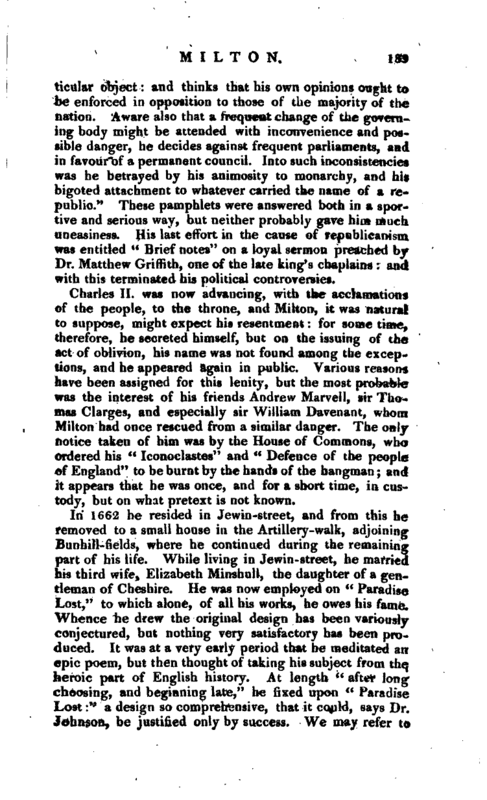 was now ’advancing, with the acclamations of the people, to the throne, and Milton, it was natural to snppose, might expect his resentment: for sometime, therefore, he secreted himself, but on the issuing of the act of oblivion, his name was not found among the exceptions, and he appeared again in public. Various reasons have been assigned for this lenity, but the most probable was the interest of his friends Andrew Marvel 1, sir Thomas Clarges, and especially sir William Davenant, whom Milton had once rescued from a similar danger. The only notice taken of him was by the House of Commons, who ordered his “Iconoclastes” and “Defence of the people of England” to be burnt by the hands of the hangman; and it appears that he was once, and for a short time, in custody, but on what pretext is not known. In 1662 he resided in Jewin-street, and from this he removed to a small house in the Artillery-walk, adjoining Bunhill-fields, where he continued during the remaining part of his life. While living in Jewin-street, he married his third wife, Elizabeth Minshull, the daughter of a gentleman of Cheshire. He was now employed on “Paradise Lost,” to which alone, of all his works, he owes his fame. Whence he drew the original design has been variously conjectured, but nothing very satisfactory has been produced. It was at a very early period that he meditated an epic poem, but then thought of taking his subject from the heroic part of English history. At length “after lon^ choosing, and beginning late,” he fixed upon “Paradise Lost:” a design so comprehensive, that it could, says Dr. Johnson, be justified only by success. We may refer to | that eminent critic, and his other biographers, for a regular examination of the beauties and detects of this immortal poem, as well as for many particulars relative to the times and mode in which he composed. These it would have been delightful to trace, had our information been as accurate as it is various; but, unhappily, every step in Milton’s progress has been made the subject of angry controversy, and they who can take any pleasure in the effusions of critical irritation, may be amply gratified in the more recent lives of Milton. The “Paradise Lost” was first published in 1667: and much surprize and concern have been discovered at the small pecuniary benefit which the author derived from this proud display of his genius. It must, in our view of the matter, and considering only the merit and popularity of the poem, seem deplorable that the copyright of such a composition should be sold for the sum of five pounds, and a contingent payment, on the sale of 2600 copies, of two other equal sums, making in all fifteen pounds, as the whole pecuniary reward of a poem which has never been equalled. 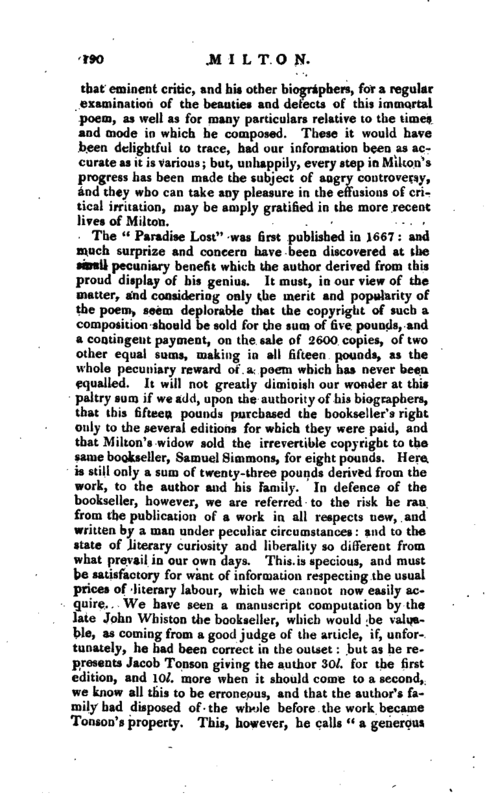 It will not greatly diminish our wonder at this paltry sum if we add, upon the authority of his biographers, that this fifteen pounds purchased the bookseller’s right only to the several editions for which they were paid, and that Milton’s widow sold the irreversible copyright to the same bookseller, Samuel Simmons, for eight pounds. Here is still only a sum of twenty-three pounds derived from the work, to the author and his family. In defence of the bookseller, however, we are referred to the risk he ran from the publication of a work in all respects new, and written by a man under peculiar circumstances: and to the state of literary curiosity and liberality so different from what prevail in our own days. This is specious, and must be satisfactory for want of information respecting the usual prices of literary labour, which we cannot now easily acquire. 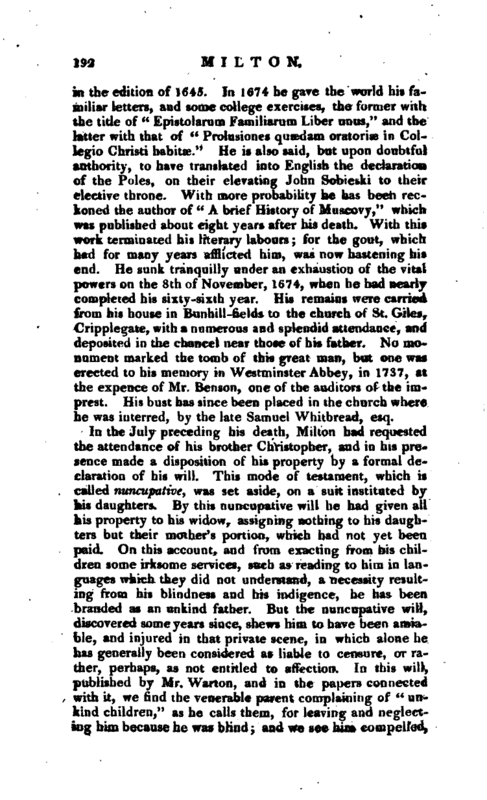 We have seen a manuscript computation by the late John Whiston the bookseller, which would be valuable, as coming from a good judge of the article, if, unfortunately, he had been correct in the outset: but as he represents Jacob Tonson giving the author 30l. for the first edition, and lOl. more when it should come to a second, we know all this to be erroneous, and that the author’s family had disposed of the whole before the work became Tonson’s property* This, however, he calls “a generous | price, as copies then sold;” and if this be true, we cannot suppose for a moment, that a scholar could in that a^e indulge any hopes of being rewarded by the public. In Milton’s case we hope he had no dependance on it, for the true way to ascertain how very paltry the sum was which he received, is by comparing it with his property, which, at his death, amounted to 3000l. In 1671, Milton published his “Paradise Regained,” written on the suggestion of Elwood, the quaker, who had been one of his amanuenses. Elwood, after reading the “Paradise Lost,” happened to say, “Thou hast said much here on Paradise Lost, but what hast thou to say of Paradise Found” This poem was probably regarded by the author as the theological completion of the plan commenced in “Paradise Lost,” and he is said to have viewed it with strong preference; but in this last opinion few have been found to coincide. Its inferiority in point of grandeur and invention is very generally acknowledged, although it is not by any means unworthy of his genius. About the same time appeared his “Samson Agonistes,” a drama, composed upon the ancient model, and abounding in moral and descriptive beauties, but never intended or calculated for the stage. To that multiplicity of attainments, and extent of comprehension, that entitle this great author to our veneration, may be added, says Johnson, a kind of humble dignity, which did not disdain the meanest services to literature. The epic poet, the controvertist, and politician, having already descended to accommodate children with a book of elements, now, in the last years of his life, composed a book of Logic, for the initiation of students in philosophy: and published, in 1672, “Artis Logica? plenior institutio ad Petri Kami methodum concinnata.” In the following year he ventured once more to meddle with the controversies of the times, and wrote “A Treatise of true Religion, &c. and the best means to prevent the Growth of Popery.” The latter was become the dread of the nation, and Milton was among the most zealous of its opponents. The principle of toleration which he lays down is, agreement in the sufficiency of the scriptures, which he denies to the Papists, because they appeal to another authority. In the same year Milton published a second edition of his youthful poems, with his “Tractate on Education,” in one volume, in which he included some pieces not comprehended | in the edition of 1645. In 1674 he gave the world his familiar letters, and some college exercises, the former with the title of “Epistolarum Familiarum Liber unus,” and the latter with that, of “Prolusiones quaedam oratoriae in Collegio Christ! habitae.” He is also said, but upon doubtful authority, to have translated into English the declaration of the Poles, on their elevating John Sobieski to their elective throne. With more probability he has been reckoned the author of “A brief History of Muscovy,” which was published about eight years after his death. With this work terminated his literary labours; for the gout, which had for many years afflicted him, was now hastening his end. He sunk tranquilly under an exhaustion of the vital powers on the 8th of November, 1674, when he had nearly completed his sixty-sixth year. His remains were carried from his house in Bunhill-fields to the church of St. Giles, Cripplegate, with a numerous and splendid attendance, and deposited in the chancel near those of his father. No monument marked the tomb of this great man, but one was erected to his memory in Westminster Abbey, in 1737, at the expence of Mr. Benson, one of the auditors of the imprest. His bust has since been placed in the church where he was interred, by the late Samuel Whitbread, esq. Of the three daughters of Milton, Anne, the eldest, married a master-builder, and died with her first child in her lying-in. Mary, the second, died in a single state: and Deborah, the youngest, married Abraham Clarke, a weaver in Spitalfields. She had seven sons and three daughters; but of these she left, at her decease, only Caleb, who, marrying in the East Indies, had two sons, whose history cannot be traced; and Elizabeth, who married Thomas Foster, of the same business with her father, and had by him three sons and four daughters, who all died young and without issue.Mrs. Foster died in poverty and distress, on the ninth of May, 1754. This was the lady for whose benefit “Comus” was played in 1750, and she had so little acquaintance with diversion or gaiety, that she did not know what was intended when a benefit was offered her. The profits of the night were only 130l. ; yet this, as Dr. Johnson remarks, was the greatest benefaction that “Paradise Lost” ever procured the author’s descendants. 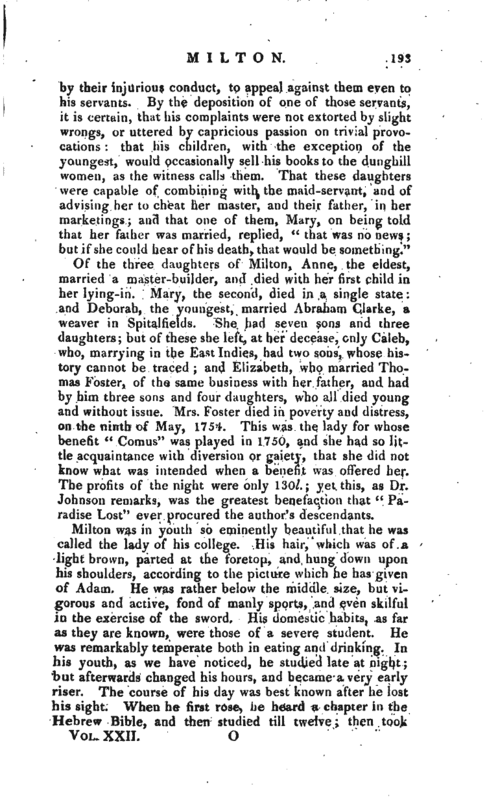 Life of Milton by Dr. Johnson, and Dr. Symmons, &c. &c. &c.